Don’t be fooled by the mysteriously looking title of this book. Most books on North Korea try to have an eye-catchy title with a bit of scandal on the book cover as these books make the biggest sales. The content is less important, as long as you write usually repeated slogans about North Korea. This is not the case this time. 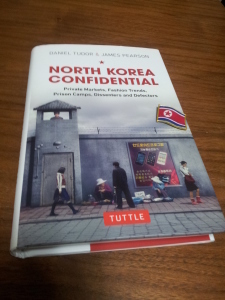 This book is not only about prison camps in North Korea. The Confidential in the title suggests something that is unknown to the public, top secret. And I feel it means the story of the Korean people that is well hidden behind all the news coverage on North Korean leadership and various human rights issues.The book is divided in a number of chapters that deal with completely different topics on North Korea. Every one of them could be read independetly as it focuses on one specific issue of modern North Korea. However, all of them are connected and show a wide spectrum of the modern North Korean society. Authors have accumulated an impressive amount of materials and interviewed dozens of people, who witnessed the reality of life in North Korea.And how does it look like to live in North Korea? Of course it’s far from the propaganda „paradise on Earth”, but contrary to the common opinion, not all North Koreans live in prison camps. Most people try to get by despite the economic hardships using their witt and entrepreneurship skills. That’s right! There is a growing middle class that is engaged in capitalistic activities in North Korea. Authors prove on many occasions that there is a thriving black market in North Korea, where one can buy everything with foreign currency. One of the most sought out product on the market are… foreign movies, dramas and music. North Korea nowadays isn’t as isolated from the outside world as one would think. North Koreans love foreign entertainment and spend their hard earned currency to buy the newest blockbusters smuggled staright from China. Don’t be fooled. Even though everyone watches those movies, the state still harshly punishes everyone who opposes their rule. However, it’s no longer able to fully control the minds of North Koreans. Both authors brilliantly show the mechanisms that function in the North Korean society and the everyday struggle of the ordinary citizens in this mysterious country. By reading this book you will be armed with sufficient knowledge that will enable you to understand what really lies behind decisions of the North Korean leadership and what North Korean society really looks like. It’s an eye-opening book that will keep you engaged and leave you with a lust for more information on North Korea. Maybe it will breed a new generation of North Korea Watchers? This book is definitely worth reading and you won’t regret spending your money on it. I tried to reach the authors of the book and I’m very happy to announce, that they’ve accepted my invitation for another Google Hangout! Be sure to check out in May. I will post details very soon, so check out my blog for more information.